+ Demonstrations and civil disobedience for democracy, solidarity and commons. Tens of thousands in several countries participated in the first part of the European days of action “solidarity beyond borders – building democracy from below”. The days of action started in Brussels on May 15th with a protest against the European Business meeting and the TTIP negotiations. The police arrested over a third of the protestors – from Belgium, Italy, France, the Netherlands – shows their nervousness! Protests however went on all over Europe the next days. Local authorities in Brussels have to explain themselves and an assembly on 19th of May will continue legitime resistance against EU-policies and TTIP. Furthermore, a People’s Tribunal evaluated the horrible results of the EU Economic Governance and the Troika. 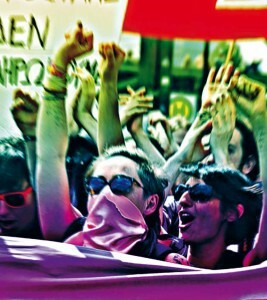 On 17th of May there were demonstrations, civil disobedient actions, and assemblies – among others – in Madrid, Rome, Paris, Berlin, Hamburg, Stuttgart, and Düsseldorf. Thousands of people took the streets all around Europe to reclaim a different management of commons, the end of austerity and privatisation, for freedom of mouvements in Europe, for the right to the city and against gentrification process. In Thessaloniki a popular referendum took place on 18 May against the privatization of water, organised by thousands of volunteers against the will of the central authority. On the 18th of May a Migrants demonstration in Bologna protested against the re-opening of the detention center in the city and for the closure of all those existing inside and outside Europe. More than 1.000 migrants, workers, students, precarious and movements, associations and unions demonstrated to denounce that the border regime of Schengen, the patrols managed by Frontex, deportations and the Dublin II agreement on asylum, all produce death on the external borders of Europe, and exploitation and precarity for all inside Europe. At the same time, refugees crossed the Germano-french border from Kehl to Strasbourg during the “March for Freedom”, while the day before in Düsseldorf Blockupy local group blocked the airport against deportations. These actions and demonstrations linked the struggles against austerity politics and precarization with those of migrants against the hierarchies produced by institutional racism, European immigration policy and border-regime. Anti-Nationalist protesters in Frankfurt interrupted a rally of right-wing populist “Alternative for Germany”. 397 of the 595 janitors protesting with a camp in front of the Ministery of Finance in Athens won a legal case and have to be re-employed by the Greek government. The camp stays untill the desicion will be implemented. This vindication of their rights, gave courage also to the rest of the cleaners and also to other employees of the public sector that fight against their “suspension status”.